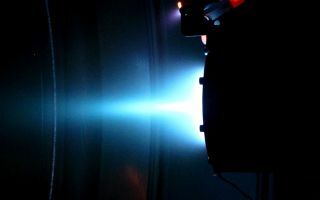 This cool space wallpaper shows a prototype Polish-built plasma thruster during test firing within an airless chamber at ESA’s Propulsion Laboratory. This cool space wallpaper shows a prototype Polish-built plasma thruster during test firing within an airless chamber at ESA’s Propulsion Laboratory. Designed and built by Poland’s Institute of Plasma Physics and Laser Microfusion (IFPiLM), this is the country’s first space thruster. Weighing 4 kg and 12 cm in length, it is a ‘Hall effect’ thruster, accelerating the ionised propellant with a magnetic field, boosting thrust compared to traditional designs. It is designed to maintain or change the orbits of low-orbiting small satellites, including compensating for drag from the top of the atmosphere.